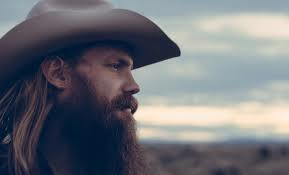 Chris Stapleton’s All-American Road Show Tour made its way to Hollywood Casino Amphitheatre Friday night. Stapleton brought along Brent Cobb and the legendary Marty Stuart & His Fabulous Superlatives for the show. The upper 90s temperature didn’t slow down the sellout crowd or the performers. Brent Cobb got the evening started off on a great the note. He started off his set with “Providence Canyon”. Next up was his tribute to his friend and mentor Wayne Mills called “King of Alabama”. Next up was Marty Stuart. Stuart’s set took the crowd through a collection of classic country including a solo version of “The Whiskey Ain’t Workin”, a cover of Johnny Cash’s “Ring of Fire”, and “Hillbilly Rock”. And wrapping up his set with his 2017 single “Time Don’t Wait”. And the finally, Stapleton took the stage, starting off with his current single “Midnight Train to Memphis. After his initial song, he would take the crowd through a journey of his past hits. Next up was “No Body to Blame”, then “Millionaire”, followed by “Fire Away”. Stapleton then brought back Brent Cobb for a duet version of “Might As Well Get Stoned”. Next up was Stapleton’s version of the Charlie Daniel’s Band’s “Was it 26”. To kick off the second half of Stapleton’s set he brought Marty Stuart back to the stage. The two did duets of Marty Stuarts “That’s Country” and “Honky Tonkin’s What I Do Best”. After Stuart left the stage, Stapleton went onto his version of “Whiskey and You”, followed by “Broken Halos”. Stapleton then brought back the namesake of his first album “The Traveler”. To wrap up his set, he did a quick verse of LynyrdSkynyrd’s “Freebird”, then transition quickly into his version of “Devil Named Music”. Then to change the mode of the crowd went into his fast-paced hit single “Parachute”. To close out his set, he teased the crowd with the first few notes of distinguishable notes of one of his hit songs. With the band still playing, Stapleton took time to do an extended introduction of each member of his band while singing to the melody of his band. Finally, Stapleton was ready to give the fully standing crowd what they wanted, the full version of “Tennessee Whiskey”.